Surface preparation is perhaps the most important factor when executing an industrial flooring project. And unfortunately it is usually the most overlooked factor. Too many flooring projects are failing, because the surface preparation was inadequate. Manufacturers of epoxy paints are appearing out of the blue boasting that their product is so good that the surface will not require grinding or priming. These claims can be very misleading, especially when large industrial projects are at stake. Surface preparation is crucial. As a rule of thumb you should expect it to take up at least 40-50% of the necessary man-hours in a project. 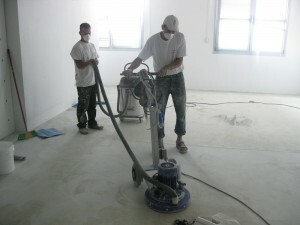 Clients often put pressure on the contractor to hurry up with the surface prep. They usually complain about the dust, the noise, or simply that its taking too much time. Poor surface preparation can lead to huge post-project problems. Problems may include the coating cracking, or detaching itself from substrate. Other problems may include bubbles or other particles in the coating, wrecking the appearance of the floor. The worst part is that the problems may not appear straight away, but after a few months when the industrial facility is in full operation. The costs for repairing the floor could be massive if operations need to be stopped.